Check out Tobi's Delilah Off Shoulder Crop Top Ready for that festival magic in the Delilah Off Shoulder Crop Top. A halter tie crop top that brings back festival feels with its special, open lace front along the chest that hugs around the neck to free spirited tassel details. It's light weight and hits at the mid stomach with flowy cap sleeves. Self proclaimed festival queens need this lace up crop top in their wardrobes. 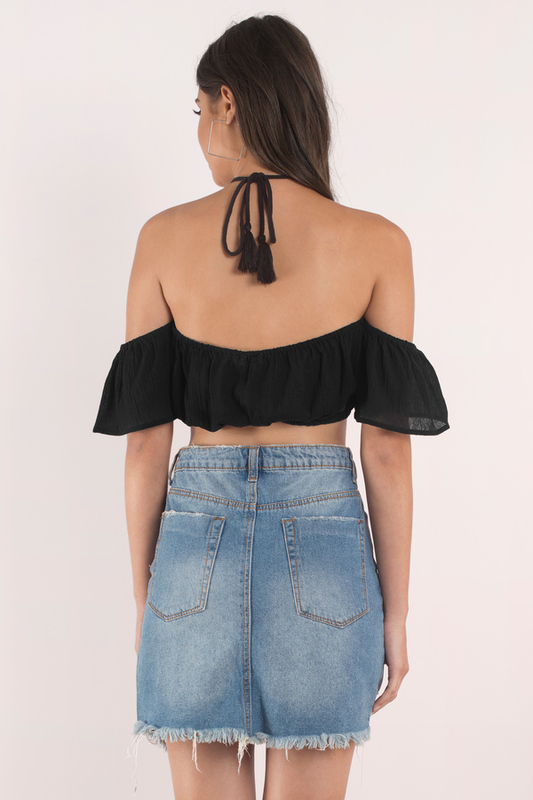 Ready for that festival magic in the Delilah Off Shoulder Crop Top. A halter tie crop top that brings back festival feels with its special, open lace front along the chest that hugs around the neck to free spirited tassel details. It's light weight and hits at the mid stomach with flowy cap sleeves. Self proclaimed festival queens need this lace up crop top in their wardrobes.